I have a fun little card to show you quick! 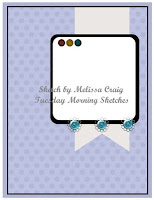 Created this little artist trading card with kind of a vintage feel to it. Then I turned it into a card for my Aunties husband. Thanks so much for taking a peak at what I have been working on today!!! Awww. This is so cute! Thank you for joining us at Tuesday Morning Sketches. Love the arc and turning it into a full size card. Love it! Thanks for playin over at Tuesday Morning Sketches. Adorable ATC and wonderful card!! That seal ATC is so cute! Thanks for playing at Tuesday Morning Sketches!